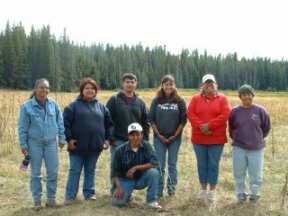 Since 1991, the Spotted Owl Crew has surveyed all spotted owl habitat in the vicinity of upcoming timber sales and monitored owls at known sites. 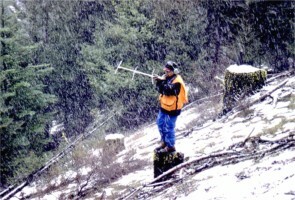 This work ensures that spotted owls are detected and afforded protections as timber sales proceed. 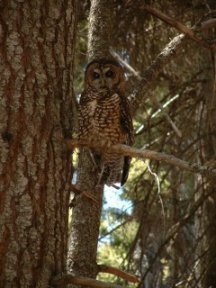 Additional work has been conducted to characterize habitats used by spotted owls on the Reservation (King et al. 1993, Pidgeon 1995), study hormonal responses to stress (Wasser et al. 1997), describe diets (Bevis et al. 1997) and characterize sites used by their key prey species (northern flying squirrels) for denning (Bevis and King 2005). Spotted owl management on the Reservation is complicated by the fact the relatively dry eastside forest ecosystem was historically heavily influenced by frequent fires, which favored pines and thinned out young fir trees. 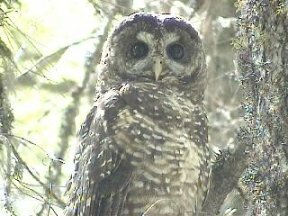 So the dense mixed conifer forests that support spotted owls would have mostly occurred in settings where fires were less frequent due to moisture and topography. By the time spotted owl surveys began, habitat was widespread because fire suppression and selective harvest practices had led to development of dense stands over large portions of the landscape. But in the 1990s, insect and disease outbreaks and large wildfires led to intensification of efforts to shift the forest back toward a more open, ponderosa pine-dominated landscape. 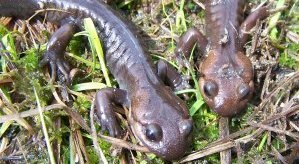 Now the Nation is working to find an appropriate balance between insect, disease and fire risks, and the need to maintain interior forest habitats for species such as the spotted owl (King et al. 1997). 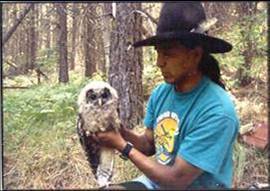 Terry Heemsah, Spotted Owl Technician, holding a Juvenile Spotted Owl. Patricia Heemsah, Spotted Owl Crew Leader, tracking an owl using radio telemetry. 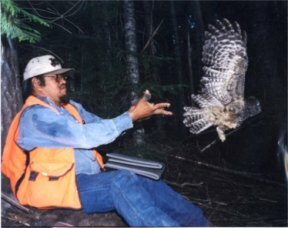 Justin Martinez, Spotted Owl Technician, releases a Spotted owl after it receives leg band. 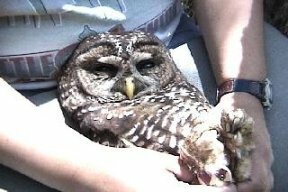 Spotted owl held for banding. For more information on this project please contact Gina King at 865-5121, ext. 6330, or Mark Nuetzmann, ext. 6333.